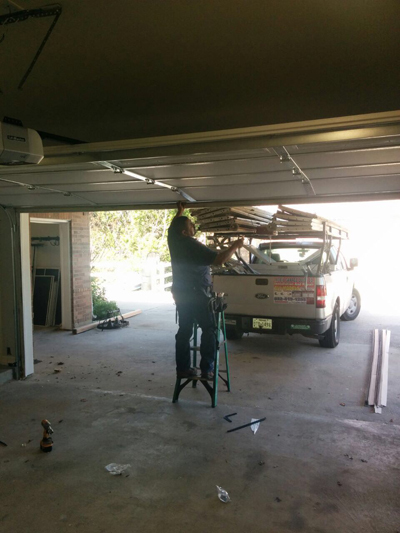 When we buy new garage doors, we don't expect complete silence. This would actually be impossible. With so many steel parts turning, stretching and moving, it is simply utopian to ask for a noiseless garage system. There would be some noise - the question is how much of it you can handle, up to what point noise is normal and what we can do about it! There are some things you can do to keep noises down and there are some efforts you can make to quiet them. For example, when you buy a new garage door opener, choose belt drive guides. They make almost no noise while the most common chain drive openers are pretty noisy. This is one of the choices you can make to spare your family some noise. From this point onwards, your only choice is maintenance. We can't really forget about garage door noise. It's here every single time we open the door. It's hurting our ears and get in our nerves especially if our bedroom is right on the floor above and we have our whole family coming and going all day long. Let's settle with the fact that garage mechanisms are noisy and let's draw our attention to whether the system has become even noisier lately. Think of what makes the mechanism noisy! This is the only way to find the perfect solution to this problem. Garage door parts are made of steel. When they move, steel is moving. Steel is dancing its way up and down and comes in contact with other steel parts. Naturally, there will be noise. Have you ever heard of steel rubbing against another piece of steel without producing some noise? What you can do is to eliminate noise and the remedy is lubrication maintenance. It's routine procedure for quieting garage doors down. Lubricants come in between steel parts. They create an oily layer which allows them to move smoothly without making the same noise. It's actually very important because lubricants won't only keep the door quiet but will also save parts from wear. When they keep rubbing on each other, the material gets damaged. Another reason why your overhead door is noisy is the loose parts. It's not strange that components need tightening. They are all secured with some sort of fasteners. They will either be screws or bolts and nuts, which get loose from the vibrations produced by the door's movement and make these vibrations worse. When screws are loose, parts are dancing and this steel against steel quick contact produces terrible noises. Although most problems related to loud doors are sorted out with lubrication and tightening of the parts, some problems are not resolved as easily. Sometimes, the noise comes from the garage door springs and when this happens, repairs are required. Noisy springs send out signs of damage and need repairs or even replacement. For your sake and for less noise, don't let loud sounds go unnoticed.